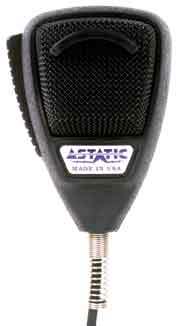 The Astatic 636L Cb microphone is recommended for 10 meter type radios to reduce feedback when talk-back is used. This is perhaps the most durable Cb Mic made. Best noise canceling Cb microphone made to cut or filter out background noise (like wind noise). When a Cb mic picks up less noise that means it is picking up more of your voice. You do have to talk very close to the mic, it will not pick up much of anything more than and inch or two from the microphone. The smaller diameter Astatic microphone cord is very high quality unlike the thick Cb microphone cords. The wires in Astatic cords virtually never break inside the cord. *Wiring for most standard 4 pin radios included. Top rated Astatic Cb radio microphones with super low prices at GI Joe's Radio Electronics.